An excerpt from a new memoir by ex-CIA agents Bob and Dayna Baer. 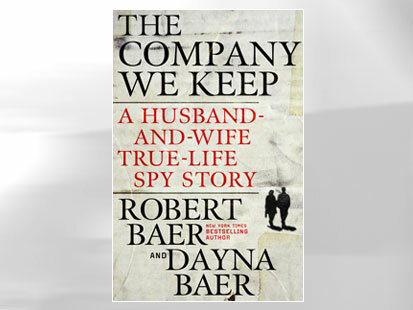 In 'The Company We Keep: A Husband-and-Wife True-Life Spy Story', former CIA operatives Bob and Dayna Baer describe how they met on the job in one of the most dangerous places in the world -- and fell in love. I think Bob's joking when he points at the station wagon parked out front of Split airport, the one we're about to drive into Sarajevo. It's lime green with a tangerine Orangina painted down the side. What's worse, it's right-hand drive, a British Vaux-hall. Bosnia, Croatia -- everywhere in the Balkans -- is left-hand drive. It just makes no sense to me, driving a billboard on wheels in to a city the Serbs have been pounding with artillery and sniping at since the civil war started in 1992. Does he want to give them something to shoot at? Bob catches my look and asks if it's a little too early for me. I can't tell if he means it sarcastically. But it's only six thirty, and I decide to keep quiet and let him think I'm sleepy. Anyway there's nothing I can do now. Although I don't work for him, he outranks me. And that's not to mention that I don't have another way to get to Sarajevo. I tell myself it'll be fine. We'll part ways as soon as we get to Sarajevo. But the car does break every rule in the book. From day one, they drilled into our heads never to drive a car people will remember. You drive something plain vanilla, like a dirty, dinged-up brown sedan. People forget plain and ugly things. This station wagon is definitely ugly, but it's a car no one will ever forget. An ice-cream truck, bells jingling, would attract less attraction. Truth is, I think Bob's a little nutty. I met him in Sarajevo the first time when Washington cabled us to meet an operative going by the name of Harold. "Harold's an alias, right?" I asked Charlie, an ex-Marine pilot I work with. We both wondered who'd agree to an alias like Harold. The only other thing the cable said was that he'd wait for us at eleven at a fish restaurant on the Zeljeznica River, ten miles outside of town. CLICK HERE to watch an interview with Bob and Dayna. It was a soft spring day. Small, fluffy clouds drifted across the sky, and the leaves were just coming out. The restaurant was packed with locals drinking and chain smoking. "Riley, Charlie!" a voice called out. It was obviously Harold. He stood up, motioning us to come over, like he was berthing an airliner. He was at a table with a half-dozen men, talking and waving a half-defoliated cigar. Charlie and I didn't move, so Harold got up, said something to the men that made them laugh, and threaded his way through the tables to join us. He stuck out his hand. "Hi, I'm Bob," he said. So much for the Harold alias. We found a free table in the corner. Washington hadn't told us what we were supposed to do for Bob, only to hear him out. Bob said we should have lunch, and recommended the grilled trout. When we told him we couldn't stay, he got right to it: headquarters had sent him to Sarajevo to go after Hizballah, the Lebanese militant group backed by Iran. It had set up in Bosnia at the beginning of the civil war to fight with the Bosnian Muslims -- at the behest of Iran. "Done right, we'll pin 'em down like butterflies," Bob proclaimed. Out of the corner of my eye I saw Charlie concentrating, making sure he'd heard right. I was sure he was thinking the same thing I was: it was Hizballah operatives that were hunting us, rather than the other way around. Three months ago we'd caught Hizballah planning to kidnap, torture, and kill a CIA operative here. We pulled him out in the middle of the night, right before Hizballah's plan was to be executed. Bottom line: we were playing in Hizballah's backyard. Bob must have seen the expression on our faces. "Invisibility," he said. "We become invisible." He talked about the stuff he'd learned in Lebanon during the civil war -- from Hizballah itself, how Hizballah created their own protective covering by constantly moving between houses, changing cars and routes, staying off the telephone and radios, and never patronizing any one establishment exclusively. "Why can't we do the same?" he said, smiling. Bob relit his cigar, sending up a fat column of smoke that crouched over the table. The cigar looked Cuban. I wondered where he'd gotten it. Probably in Sarajevo's black market, where you could find anything from machine guns to stolen cars. That was pretty much it for the first meeting. I wouldn't see Bob again until this day: in front of Split airport, leading me toward a car you can see from the surface of the moon. I throw my bag into the back of the station wagon and climb in the passenger side. So much for being invisible, I think. We start the five-hour drive to Sarajevo not saying a word. Bob breaks the silence by telling me how he's rented the car from a British former military officer who owns a small travel agency in Sarajevo. "What does he think you do?" I ask. "It doesn't matter. The point is, he'll catch any flak the car draws, not us." I nod my head, letting him think he's convinced me of the logic of it, and we fall into another long silence. As he darts in and out of a British tank convoy, I can't figure out how he sees to pass. I wonder about the butter-yellow houses we are passing, with their red tiled roofs. How was it that an incredibly bloody war started in a place like this? These people are modern Europeans, and then one day, I don't know, sitting around watching a national football championship on Eurovision, they picked up axes and started killing each other, Croats slaughtering Serbs, Serbs slaughtering Bosnian Muslims. Aren't they all Slavs? And don't they all look alike and speak the same language? It just doesn't make sense to me. But headquarters doesn't really care if I know next to nothing about Bosnia. My job is to surveil the Arab Mujahidin, who showed up here at the beginning of the war. Period. At Sarajevo's outskirts I point to a trolley stop, telling Bob I'll get off here. He shakes my hand, and I watch his lime-green station wagon as it disappears into traffic. I don't mind when it starts to rain and I reach to pull up the hood of my parka. The fresh air and uncomplicated anonymity feel good. A week later, headquarters cables that Charlie and I now work for Bob -- chasing Hizballah. We're immediately to cut all contact with the embassy and scatter to diffferent houses and apartments around Sarajevo. Charlie finds his own place, and I'm to move temporarily into a safe house Bob works out of until I can find my own apartment. Charlie drops me off at a two-story house in a village near the airport, a place called Butmir. The house is overgrown with trees and shrubs. One side faces "the green line"—the confrontation line between Serbs and Muslims. It's pockmarked by bullets. The fields around the house are bordered by blue tape with little skulls and crossbones -- land mines. Bob comes out of the dark house and grabs my duffel bag. Inside, he gives me a quick tour. The owners fled at the beginning of the war, he says, which explains the thick coating of dust everywhere. The food in the refrigerator is calcified. A couple of the windows are shot out. You can see where a bullet came through a window, ricocheted off the ceiling, knocked over some knickknack on the shelf, and lodged in the wall in the living room. There's an upstairs bathroom, but the water's shut off, just as it is to the rest of the village. Bob takes me back downstairs and points at a hose coming through the window of the downstairs laundry room. It's connected to an irrigation pipe off Igman, the mountain that sits just southwest of Sarajevo. He says the showers wake you up fast. I turn it on. The water's icy. The hose is the only way to flush the toilet. It's completely dark now. Bob turns on the light, but tells me not to get used to it. The electricity goes off in a half hour, and there's no generator or flashlights. I say good night, go downstairs to my bedroom, pull the dusty sheets off the bed, and spread out my sleeping bag. As Bob promised, the lights flicker off, and I lie there in the black. Just as I close my eyes, a machine gun fires in the distance, from the direction of the green line. An angry fusillade answers. I sit up expecting Bob to come out of his room. But there's not a sound. A rocket explodes in the direction of the airport. I wonder if this isn't the start of something serious, like a Serbian attack on Sarajevo. I don't hear a sound from Bob's room, and can only think he's sleeping through it. I zip up my sleeping bag. If it isn't going to bother him, it's not going to bother me. After an hour the shooting tapers off and stops. The last thing I remember before falling asleep is that I haven't seen the lime-green station wagon. It seems to have been replaced by an old Toyota Land Cruiser with rust-chewed doors and a cracked windshield. That's a start.